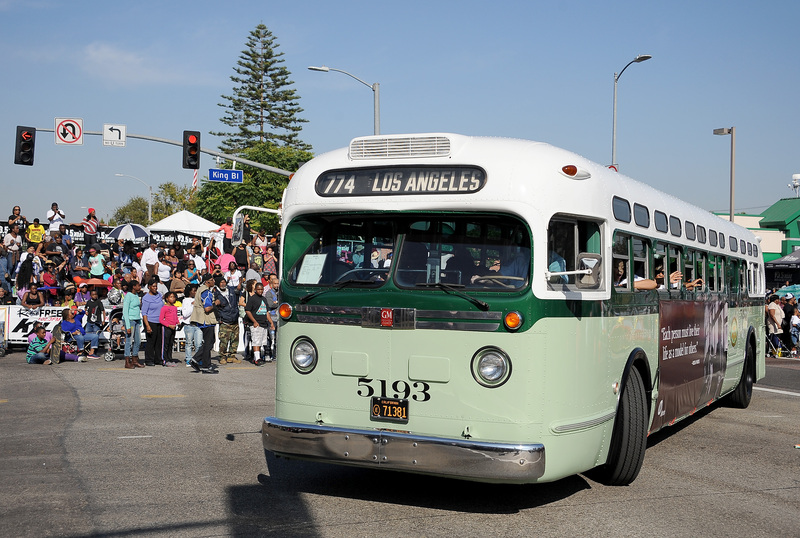 Celebrate Martin Luther King Jr. Day by going Metro to the 34th annual Kingdom Day Parade on Monday, Jan. 21. The Expo Line Expo/Western and Expo/Crenshaw stations are just a short walk from the parade route. The Expo Line runs between downtown Los Angeles — where it connects to the Blue Line and Red/Purple Line — and downtown Santa Monica. The parade will begin at 10 a.m. at the intersection of Arlington Avenue and Martin Luther King Jr. Boulevard and then travel west to Crenshaw Boulevard, where the route turns south into the heart of Leimert Park Village. For viewing near the start of the parade route, take the Expo Line to Expo/Western Station and walk south to Martin Luther King Jr. Blvd., then turn right and walk to Arlington Ave.
For viewing along Crenshaw Blvd., take the Expo Line to Expo/Crenshaw Station and walk south to Martin Luther King Jr. Blvd. or transfer to Metro Bus 210. Exit at 39th Street and Crenshaw Blvd. and then walk one block south. All Metro Bus and Rail lines will be running on a regular weekday schedule. The following Metro Bus lines that operate on Crenshaw and Martin Luther King, Jr. boulevards will be on detour from 5 a.m. to 4 p.m. on Monday: the 40, 102, 105, 206, 207, 210, 212, 705, 710, 740 and 757. For specific detour route information, check metro.net/advisories.